We're investing £6.5m into research and health services in order to improve early diagnosis, treatment and quality of life for Yorkshire cancer patients. 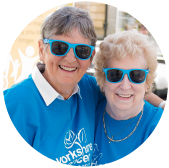 Every single person in every community in and around Yorkshire should have the very best chance of living a long and healthy life with, without and beyond cancer. Since 2015 we’ve been working towards our goal of 2,000 fewer people dying of cancer, every year in Yorkshire. We’re working in local communities, raising awareness of cancer symptoms, making sure people attend their screenings and investing in leading-edge cancer research. Our latest community health project has provided over 2,000 people with information and knowledge needed to live a healthier life, attend vital screenings and lower the overall risk of cancer. The breast cancer drug Tamoxifen and the ovarian and breast cancer drug Lynparza - developed with the help of our funding - have improved and extended the lives of millions of women around the world. are told they have cancer. lose a loved one to cancer. That’s 14,000 people each year – more than the Leeds First Direct Arena can hold. in Yorkshire are living with or have had cancer. Sometimes many members of the same family carry a faulty gene which means they can be at higher risk of certain types of cancer. Yorkshire has a very diverse population. Some types of cancer are more common and survival rates lower, in disadvantaged communities. Smoking is the main lifestyle related risk factor causing 2 in 10 cancers. Yorkshire has the highest smoking rate in England. £1 could enable us to send someone an information pack to attend a Lung Health Check. If 10 people donate £15, we could fund a mobile CT scan for someone at high risk. £35 pays for services such as an in-depth health check to help prevent cancer.